The Children’s Law Project of Hawaii, left, Executive Director Valerie J. Grab, Tausala Pola, Camlyn Pola, Rycen Pola, Third Circuit Family Court Judge Darien W. L. Ching Nagata, and the youngest Pola sibling (center front). 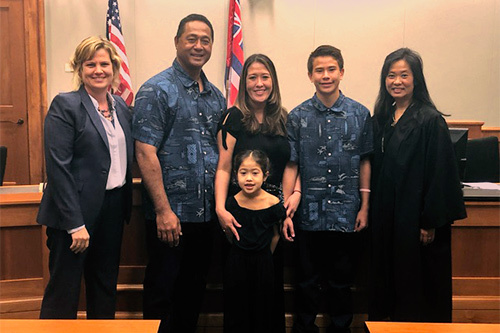 Third Circuit Family Court Judges Darien Nagata and Dakota Frenz recently collaborated with the Children’s Law Project of Hawaii and the State of Hawaii Department of Human Services to finalize adoptions in conjunction with National Adoption Day 2018. The Hilo Family Court held adoption hearings so that children could legally become part of their “Forever Families” on November 16, 2018.